The net worth of US households tumbled 3.5 percent quarter-on-quarter during the fourth quarter of 2018, according to the US Federal Reserve. Only twice since 1952, once in 1962 and again in 2008, was a larger drop reported, and yet for most Americans it’s the proverbial tree falling in the woods: did anyone feel it? The slump in 4Q 2018 is attributable to the poor performance of the stock market in late 2018 and the corresponding hit to the value of household holdings of corporate equities. It's a familiar story. Historically, corporate equities have caused the most volatility in US household net worth, especially in the negative direction; the value of household real estate holdings fell only during the global financial crisis of 2008. The vulnerability of households to fluctuations in stocks and real estate is directly attributable to the fact that real estate and equities constitute roughly half of all US household assets. Liabilities, e.g. household debt, are dominated by home mortgages and consumer credit. So, did Americans notice? For most part, no. Only half of all American households own stocks and nearly 80 percent of all wealth in the US is owned by just 10 percent of the population. 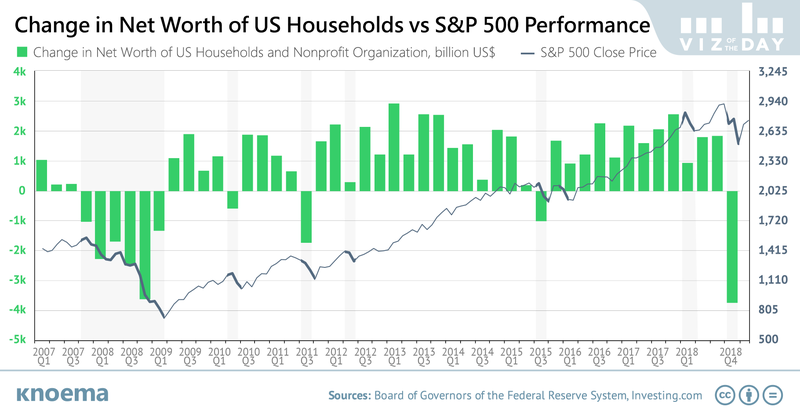 For these 10 percent, ultra-rich households, movements of stock indices reflect real changes to their net worth and they are looking to recover in 2019 (or at least before retirement); for the rest of Americans, this was a blip of little direct consequence.